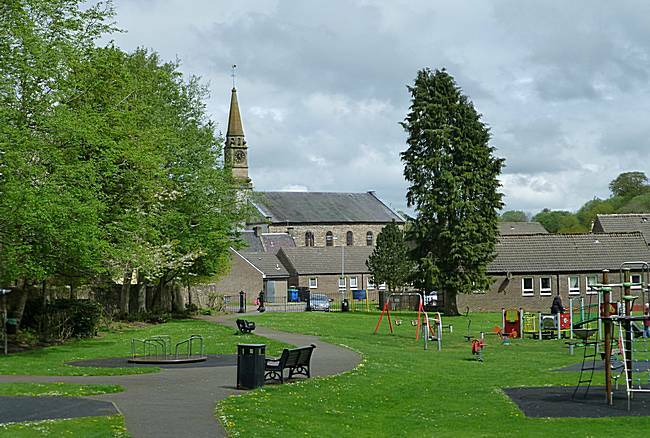 More images of Lesmahagow and district in South Lanarkshire, Scotland. Bank of Scotland, Lesmahagow from Bloomfield Road. 19th Aug 2014. Royal Bank of Scotland, Lesmahagow. 19th Aug 2014. Glebe Gardens, Lesmahagow. 23rd Aug 2014. Glebe Hall, Lesmahagow. 23rd Aug 2014. View through the Fountain, Lesmahagow. 23rd Nov 2014. View through the Fountain, Lesmahagow, showing the Bank of Scotland and the Fountain Community Hall. 23rd Nov 2014..
Remembrance Sunday Procession, Lesmahagow from War Memorial in cemetery to Lesmahagow Old Parish Church. 9th November 2014. Lesmahagow Old Parish Church. 23rd August 2014.